PDF of 3D-Con/ISU Congress 2017 Program. Read all the details! Stereo Theatre, Workshops, SIG, vendors, biographies, activities, field trips and everything else going on this week at 3D-Con!. 3D-Con ActivitiesPreview. This article by David Kuntz appeared in a recent Stereoscopy. Feel free to print this out and make it available to your club members. Come immerse yourself in some spectacular 3D over six action-packed days! This joint ISU World Congress and National Stereoscopic Association Annual Convention (3D-Con) will offer the best of both experiences, and will be the place to find a cutting-edge stereo theater, informative workshops, a stereoscopic art exhibition, image competitions, room hopping, a 3D auction, a large trade fair, and a technical exhibit of new equipment and displays. Plus, you'll enjoy excursions to unique attractions in Southern California. In 2017, the event will take place in Irvine, California, USA, which is about 45 miles south (approximately 1-1/4 hour driving time) of downtown Los Angeles, the second largest city in the United States. Los Angeles is known throughout the world, in particular because it includes Hollywood, the center of the US film, television and entertainment industries. Los Angeles is a tourist mecca, and currently hosts about 45 million annual visitors. The greater Los Angeles area includes a multitude of iconic sights, including the Hollywood sign, the Hollywood Walk of Fame, most of the major US film and television studios, as well as other points of interest, such as Griffith Observatory, the Getty Center, Rodeo Drive in Beverly Hills, the Walt Disney Concert Hall, the Space Shuttle Endeavour (at the California Science Center), and a number of famous beaches, including Venice and Malibu. Our event venue is the Hotel Irvine. Irvine is a planned community located in Orange County. Irvine consistently ranks as the safest city in America with over 100,000 in population. The city, only a few decades old, is home to the University of California, Irvine, a gem of the state university system. A section of the former El Toro Marine Base, located within city limits, was turned into Orange County Great Park. The park features a helium balloon ride which offers breathtaking views of Orange County. Close by Newport Beach has pristine beaches and historic areas. Of course, Los Angeles, Hollywood and Santa Monica, and all that they offer are in proximity. What is the 3D-Con, NSA and ISU? The National Stereoscopic Association is a non-profit organization founded in 1974, whose goals are to promote the study, collection and use of stereo photography it has over 1,000 members. ISU is the International Stereoscopic Union. The International Stereoscopic Union (ISU) was founded in 1975 and is the only international 3D association in the world. The ISU is a club of individual 3D enthusiasts as well as a club of stereo clubs. The ISU's members currently number more than 1,050 and come from over 40 countries world-wide. 3D-con is traditionally the name of the NSA annual convention. Every few years there is a combined ISU/NSA convention. These are generally very well attended compared to the uncombined conventions. 3d-Con 2017 is a combined convention. The convention has programming for the collector as well as the photographer. Among the highlights are: the trade show, the stereo theater, workshops, tours, and auction, and birds-of-a-feather meetings. The event will offer slide and print contests and showings of stereo (3D) photography, a trade show, field trips, banquets and other goodies. Irvine is convenient to Disneyland; Knott's Berry Farm; Legoland; Universal Studios; and of course Southern California is the home to several large antique areas such as 2nd Street in Pomona and the Circle in Orange. Thanks to David Kuntz for the 2017 logo! 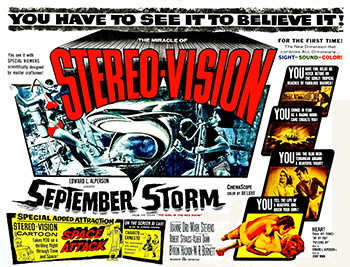 National Stereoscopic Association, Co-Host of the convention. LA 3D Club, Host club for the convention. Thanks to Nvidia for the their image competition sponsorship!